Banana Tres Leches Cake – classic tres leches cake meets the flavors of the tropics to make one seriously incredible and addictive cake. This cake is definitely one of my favorites! I have made it many times and every time I can never stop at just one slice. It’s not often I use a box cake mix, but with this recipe you would never now it started from a mix. 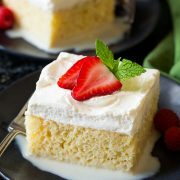 Tres Leches is such a creamy and moist cake thanks to its “tres leches” translated in English to “three milks.” Then you throw bananas and coconut into it using this recipe and wow! 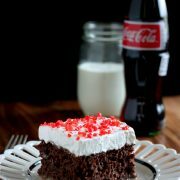 Basically this is the cake of Heaven =). When I bake this cake I just like to pretend it’s my birthday even when it’s not, so I can eat as much of the cake as I want. This cake was baking in my oven today while I was exercising and boy was it hard to keep going as I could smell the sweet, intoxicating aroma of this cake filling my home. I kept imaging racing over, as though I had animal instincts and diving into the cake with my hands =). This cake is just that good! Wondering what to do with the left over coconut milk you have remaining after making this recipe, try my Pina Colada Floats, a refreshing tropical delight. 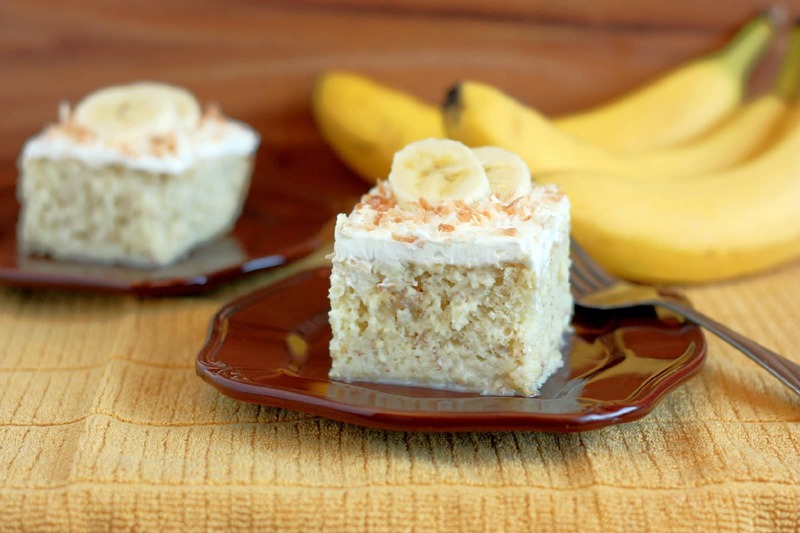 Classic milk soaked tres leches cake meets the flavors of the tropics with banana and coconut to make one seriously incredible cake! Preheat oven to 350 degrees. Butter the bottom only of a 13x9 baking dish. 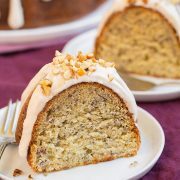 In a large mixing bowl, combine cake mix, water, vegetable oil, eggs and mashed bananas. Using an electric mixer, beat ingredients on low speed for 30 seconds then increase speed to medium and beat for 2 minutes, scrapping down the sides of the bowl frequently. Pour mixture into prepared baking dish and bake 33 - 38 minutes until toothpick inserted in the center comes out clean. Allow cake to cool completely about 1 hour. In a large mixing bowl, whisk together sweetened condensed milk, coconut milk and half and half. Poke top of entire cake every 1/2 inch with a large rimmed fork. Pour milk mixture evenly over cake. Cover cake and refrigerate 2 hours (or overnight) until liquid is absorbed into cake. In a medium mixing bowl, using an electric mixer, whip heavy cream until soft peaks form. Add in granulated sugar and beat until stiff peaks form. Frost cake just before serving with sweetened whipped cream and sprinkle cake evenly with toasted coconut. Garnish cake slices with sliced bananas. Store cake in refrigerator.